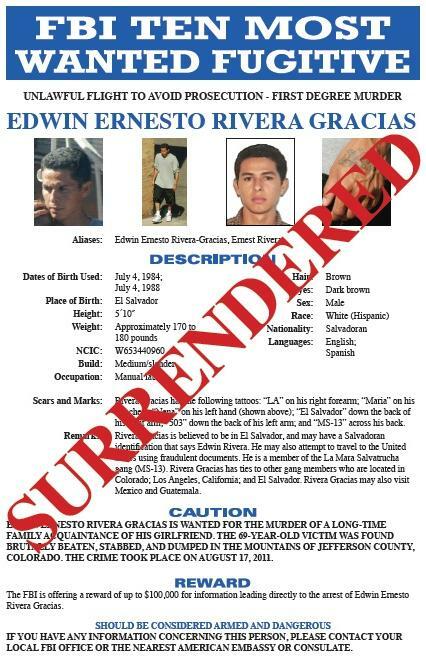 Less than two weeks after being added to the FBI’s Ten Most Wanted Fugitives list, Edwin Ernesto Rivera Gracias voluntarily returned from El Salvador to Colorado to be charged with first-degree murder, USA Today reports. Rivera Gracias, who surrendered after the FBI announced a $100,000 reward, was wanted for the Colorado slaying of Richard Limon, 69, who had been stabbed to death. According to an affidavit, Limon was the father of Rivera Gracias’ girlfriend and had molested her when she was younger, USA Today wrote. Posted: 3/28/13 at 8:49 AM under FBI, News Story.